Christopher Hybrid Model basses combine the tonal superiority of carved bass with the affordability of a laminate bass. The hand carved spruce top dramatically improves the overall tonal characteristics. The tone is stronger and more defined compared to laminated tops. 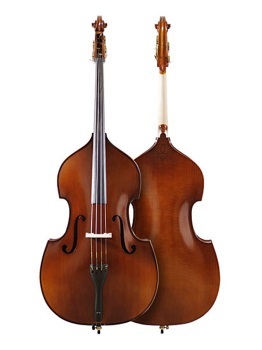 The back is created with the same methodology that is unique to Christopher basses. Adjustment includes ebony tailpiece, bridge adjusters, high quality endpin, and Helicore Orchestral strings.